SAN LEANDRO | When it comes to armored personnel carriers, San Leandro is one of few East Bay jurisdictions without the controversial vehicles, which some opponents charge overtly militarizes small local police departments like San Leandro. The city submitted a joint state grant last fall to fund the costs of the vehicle known as a Lenco Bearcat MedEvac, along with the Alameda County Fire Department and Fremont Police and Fire. A version of the Lenco Bearcat will be on display Thursday afternoon at 5 p.m. and precedes a 6 p.m. public meeting (San Leandro Senior Community Center, 13909 East 14th Street) on the efficacy of purchasing the armored carrier. The direct expenditure of the vehicle would be split among the three jurisdiction at a cost of about $33,000 apiece, the city says. Knowledge of the grant was not well-know until some San Leandro privacy activists noted the police department’s plans for the vehicle used for a host of dangerous law enforcement situations including SWAT, serving warrants and confronting alleged criminals deemed armed and dangerous. 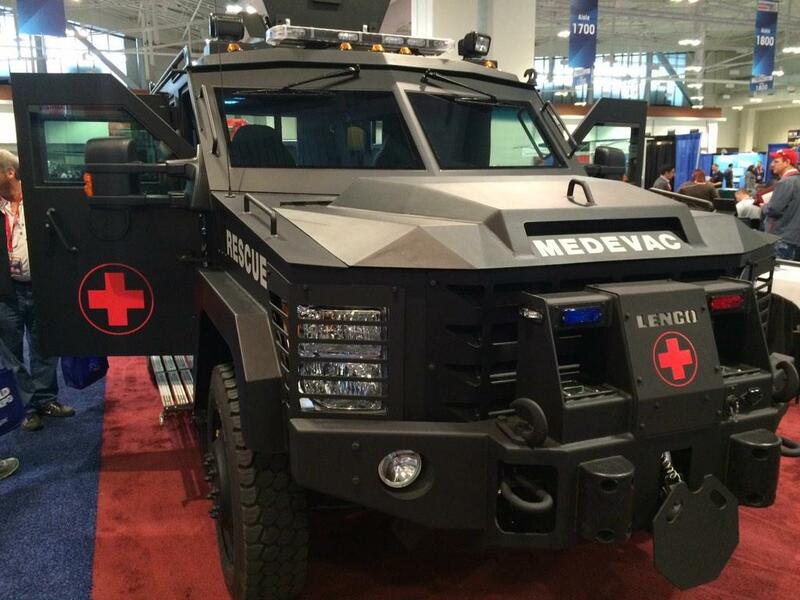 The San Leandro PD, though, says the armored vehicle will be mostly deployed in medical emergencies and will be the first use of its kind in the East Bay. However, the police department has some familiarity with similar models of the armored carrier. In addition, the potential purchase of the armored vehicle is not military surplus, the city says, nor is is a military personnel carrier distributed through the U.S. Department of Defense. Critics, though, worry the slow merging of the nation’s perpetual war effort with local police departments will have a chilling affect on privacy and human rights down the line. Furthermore, defense contractors are a powerful lobby interested in cultivating new customers as the war effort winds down. For instance, the promotional video for the Lenco Bearcat, first noted by East Bay Express contributor Darwin BondGraham, highlights an over-the-top macho tone. Among the members of the San Leandro City Council, few have taken a clear stance on the armored vehicle. Although, it was a campaign issue during the most recent election, most public officials have questioned whether the vehicle is appropriate for a quiet suburban city like San Leandro, while also offering deference to Police Chief Sandra Spagnoli, who backs the purchase. This week, newly-elected Councilmember Deborah Cox urged residents to take a look at the armored vehicle for themselves while suggesting it was less imposing than what critics describe. Posted in Alameda County Fire Dept, armored personnel carrier, Deborah Cox, Hayward Police, Lenco Bearcat MedEvac, public meeting, san leandro, Sandra Spagnoli, Stephen Cassidy. Bookmark the permalink.